We will start the tour with a visit to an Islamic place of worship - the famous Jama Masjid, which is covered with intricate carvings and has verses inscribed from the holy Koran. The spacious courtyard of the Jama Masjid is so large that thousands of devotees can pray together at one time. The hall of the Jama Masjid is made up of high cusped arches and marble domes. Continue to visit a Sikh place of worship- Gurudwara Bangla Sahib, situated in the heart of New Delhi. This was originally the Bungalow (Haveli/Bangla) of Mirza Raja Jai Singh, hence the name Bangla Sahib. Its original name was Jaisinghpura Palace. Our next stop today is the Christian house of prayer- the Cathedral of the Sacred Heart. A Roman Catholic cathedral belonging to the Latin Rite and one of the oldest church buildings in New Delhi, India. Next is Bahai Temple - the famous Lotus Temple. The temple looks like a lotus flower and is open to people from all religions. The place provides immaculate environment for meditation. Since 1986 when it was completed the temple has received recognition from all over the world for its splendid architecture and design. 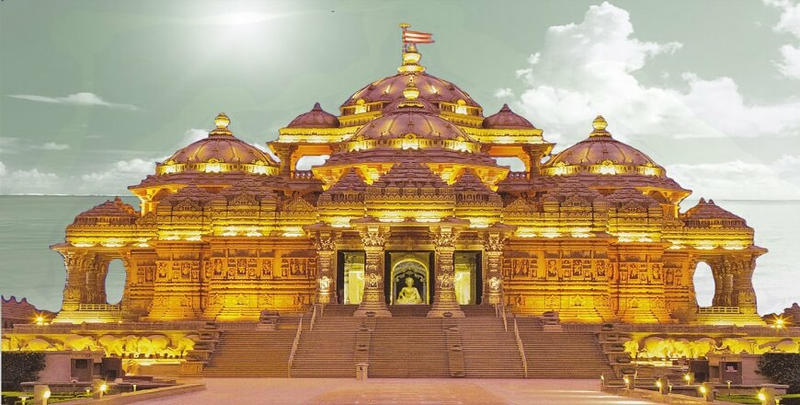 Last but not the least you are going to visit one of the most famous Sites of Hindu “The Akshardham Temple”, it is the place where you can see 10000 years of Indian culture. The tour will take you to the main temple, Abhishek Mandap, exhibition, gardens and finally end with the water show (depending on time).